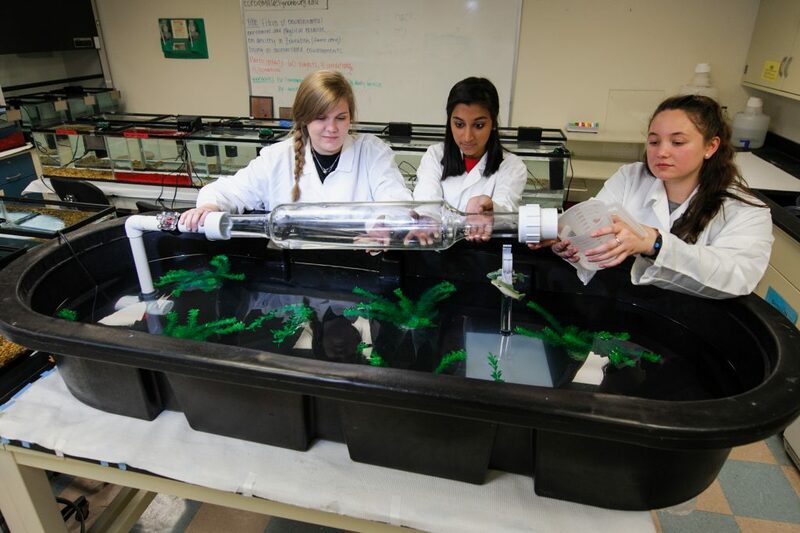 In University of Lynchburg’s Physiological Psychology Lab, the zebrafish are exercising. No, the striped, guppy-like fish aren’t doing step aerobics in tiny sneakers, but what they are doing is helping a team of researchers learn about the effects of exercise on anxiety. 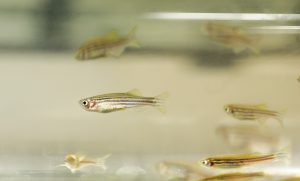 The idea, conceived by psychology professor Dr. Keith Corodimas, was to take zebrafish living in “impoverished” conditions — without plants, rocks, or other fish for company — and see if their behavior changed after being exposed to exercise. These fish would be compared to fish living in impoverished environments that weren’t exercised and fish living in “enriched” environments — with plants, rocks, and company — that were exercised and not exercised. The initial hypothesis was that exercise would make all of the fish, regardless of environment, less anxious. Zebrafish (Danio rerio) are used in scientific research as model organisms for humans. While using zebrafish as model organisms for humans is nothing new, Dr. Corodimas said the research he and his students are doing is the first of its kind. Researchers in Brazil have studied whether learning is enhanced in zebrafish who were exercised, and others have studied how exercise affects metabolism and muscle growth. This is something altogether different. “We are looking at whether exercise can reduce or prevent the detrimental effects of fish living in socially- and structurally-impoverished environments,” Dr. Corodimas said. “This is extremely novel. Virtually all exercise research in non-mammalian vertebrates, like fish and baby alligators, has looked at effects on metabolism, muscle growth, etc., but not behavior. For Collins, who introduced the project at the Student Scholar Showcase in April, it’s not the first time she’s worked with zebrafish. She has studied the effects of L-DOPA, a drug used to treat Parkinson’s and other diseases, on zebrafish and anxiety. After she graduates in May with degrees in psychology and biomedical science, Collins will head to Montreal’s McGill University, where she’ll pursue a PhD in neuroscience. There, she’ll work under Dr. Myriam Srour, a scientist who uses zebrafish and other model organisms to study congenital mirror movement disorder. 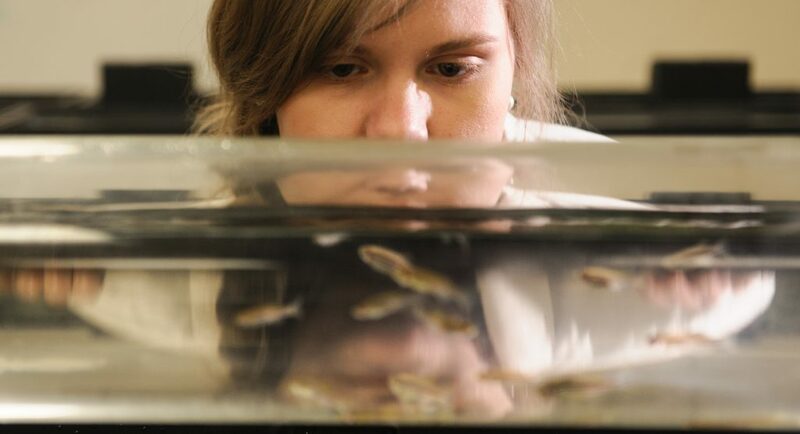 Katie Roderick ’19, a member of the ‘Research Dream Team,’ observes the zebrafish during testing. The experience also will help Roderick meet her career goals. “I plan on becoming a professor and I would love to do research with undergraduate students, so this whole experience has given me ideas on how I want to go about that in the future,” she said. One doesn’t just start exercising zebrafish overnight. In addition to assembling a research team, it takes planning, along with a means by which to make the fish exercise. What the team needed was an endless pool of sorts — actually, two endless pools — made just for fish. Because these kinds of setups are expensive, as much as $10,000 each, some do-it-yourself-ing was in order to accommodate a significantly smaller budget. “That was stressful because I don’t know squat about any of that,” Dr. Cordimas admitted. Undeterred, Dr. Corodimas searched the internet, he talked with plumbers, and he found a glass blower in Texas who could make tubes for the fish to swim in. He bought pumps, flowmeters, and PVC tubing. There were screens for both ends of the glass tubes “to prevent the fish from swimming into the pump or out the downstream end,” water heaters to keep the fish warm, and a couple of food-grade agricultural troughs to hold everything. And, of course, water. The ‘Dream Team’ (left to right) Katie Roderick ’19, Mihika Corodimas ’19, and Meagan Collins ’18 get ready for testing. So, this was the plan: Every day, for two weeks, groups of zebrafish — 60 total — would swim against a current for 10 minutes. In addition to using state-of-the-art software to track, record and analyze the fishes’ movements, the researchers would use two tests to see if the exercise caused the fish to become less anxious: the light/dark test and novel tank test. This summer, after Collins graduates, Roderick and Mihika Corodimas will continue their zebrafish research on campus with a $3,100 grant from Lynchburg’s Faculty Development Committee. The project also has received funding from the Schewel and Wootton funds.